The unexpected death of Boris Berezovsky has moved his relations with the Belarusian authorities into the spotlight. Over the past 15 years Boris Berezovsky regularly appeared in Belarusian politics. Analysts are even discussing a possible friendship between Boris Berezovsky and Aliaksandr Lukashenka. To demonstrate his influence, Berezovsky came to Minsk with a group of Russian media executives. After a meeting with Lukashenka, Berezovsky publicly condemned the position of the TV channel toward Belarusian officials and as a result the authorities released the journalists. According to Aliaksandr Fiaduta, who wrote a biography of Aliaksandr Lukashenka after that meeting, mutual understanding between the Belarusian president and Boris Beresovzky has always been very good. The next official meeting occurred in 1998. Berezovsky came to Minsk as an executive secretary of the Commonwealth of Independent States (CIS). The Belarusian ruler warmly greeted him and their meeting lasted over two hours, instead of the intended one hour. 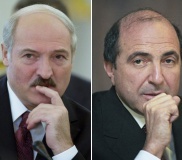 They were negotiating the prospects of the CIS, and the Belarusian leader even proposed that Berezovsky settle in Minsk. Subsequently, The Daily Mail reported that Berezovsky had purchased property in Minsk. Another story which make Berezovsky's connections in Belarus evident was the arrest of Emanuel Zeltser - the lawyer of one of the relatives of the deceased Georgian billionaire Badri Patarkatsishvili.